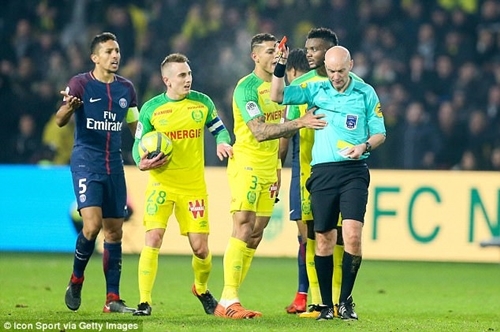 A French referee, Tony Chapron became a villain of PSG’s 1-0 win at Nantes on Sunday, after responding to an accidental collision with Diego Carlos before kicking the Brazilian and sending him off. 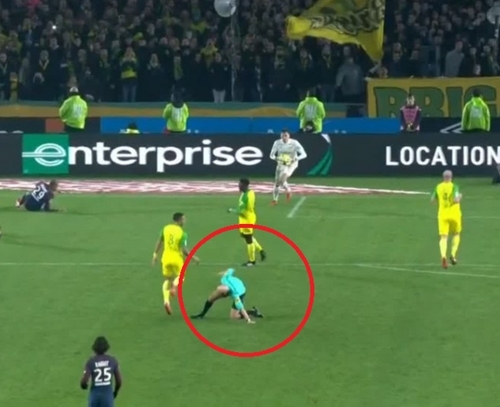 French referee Tony Chapron has apologised after kicking out at Nantes defender, Diego Carlos and sending him off for a second bookable offence after accidentally being tripped, Dailymail UK reports. 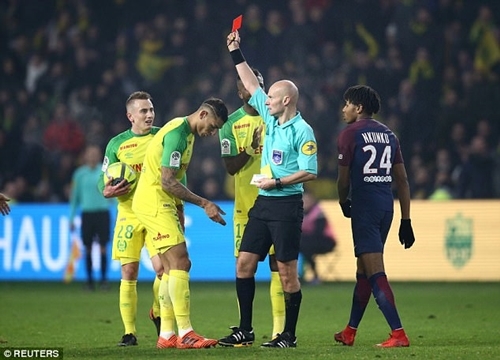 Carlos was already on a yellow card when Paris Saint-Germain counter-attacked and the Brazilian inadvertently collided with the referee as he tracked back. After he hit the ground, Chapron kicked out and then issued Carlos a second yellow, followed by a red. ‘During the match Nantes-PSG I was knocked over by Diego Carlos, a player with Nantes. At the moment of impact I felt a sharp pain where I had recently suffered an injury,’ Chapron said on Monday. Earlier on Monday, Chapron was suspended by the French football federation ‘until further notice’ for his actions. According to the FFF, Chapron acknowledged that Carlos inadvertently knocked him over and will provide further details in a report to be submitted to the French league’s disciplinary committee. Nantes president, Waldemar Kita called for Chapron to be banned for six months after the match. ‘I received 20 SMS from all over the world telling me that this referee is a joke,’ Kita told L’Equipe. ‘What do you want me to say to you? If I talk too much, I will be summoned by an ethics commission. We have no right to say anything. ‘Chapron has to rest and get a massage, it works like that now, we cannot see him. I’m waiting for the green light, otherwise I’ll be killed. It’s amateurism. ‘At least, you apologise but you do not give a red card, it’s not serious. We still have to find a solution, because there is a problem in all this. PSG won the game 1-0 thanks to a goal from Angel Di Maria.